It’s here! 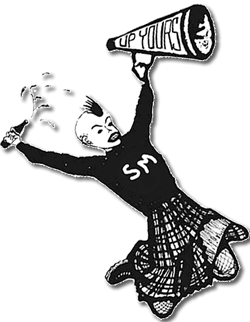 Right in the Head – twelve tracks of unmitigated She Mob. What was the lead-up to this incredible happening? 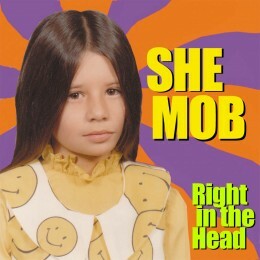 She Mob, on a seemingly never-ending hiatus, was reformed when Karry Walker (Ultralash, The Hollywood Laundrette) gave Joy (Sue) a call and said, “She Mob should reform, and I’ll play bass if you’d like.” Or words to that effect. Soon thereafter the foursome was rocking out once again in a rehearsal space in the Temescal neighborhood in Oakland, watching the neighborhood go from sleepy every-day urban environs, to explosive gourmet foodie-ville with fixie bikes speeding by. It’s been a journey. Suki O’Kane and Lisa McElroy (back again) trade places on the drums, occasionally sitting in on keyboards. Suki’s taken up bass and trades with Karry, who also plays keyboards. Joy’s mainly on guitar, but wants to play bass more often, and actually does on one song. We’re all singing. It’s happening, man. Recorded, mastered by Myles Boisen, behind-the-scenes member of She Mob.